If you Want to Win Customers, Ask Them How. From January through March I participated in a 12 week Body Transformation contest through bodybuilding.com. My husband and I wanted to improve our health so the timing and prize potential of the contest was the perfect motivator. The requirements included submitting a before and after picture, getting engaged in the bb.com online community and posting photos of your transformation throughout the contest. The winners would be selected by a panel of judges based on percent body fat lost, weight lost, participation and overall transformation. Two grand prize winners, one male and one female would each win $100,000 (heck yeah!). 25 semi-finalists would be chosen with five of them each winning $10,000 determined by online votes. We could improve our health while possibly winning a substantial amount of money, we were all-in! We found a trainer, developed a fitness and nutrition plan and stayed deeply committed. During the 12 weeks we transformed inside and out and by the end I had dropped 24% body-fat (measured by a body-fat skin caliper) as well as 19 pounds and felt great. Two weeks ago the 25 semi-finalists were announced and it was awesome to see so many amazing transformations! While I was disappointed that I hadn’t made the semi-finalist list, after seeing the photos and comparing the progress of the 13 semi-finalist women against my own, my husband, trainer and I were hopeful that I might actually have a chance at winning! The highest percent body fat lost by any female semi-finalist was 19% and I had lost 24% body fat and we felt that my photos an participation level were just as competitive. I felt that I had met all of the requirements necessary to possibly win. The next week was one of the longest of my life as we waited for the winner announcement. Like waiting to see if you landed a new customer or closed a sale, the wait was agony. Bodybuilding.com announced that they’d be revealing the winners via Snapchat so I anxiously followed their snaps until last week when their prize patrol team shared that they were in-route to surprise one of the winners, in the background were palms trees. Living in Wisconsin, there are no palm trees for miles, so unless they were playing a trick, I knew my chances of being one of the winners had just gotten slimmer. The following day, they were off to surprise the next winner, and again there were a series of clues showing them traveling by plane, by car, then walking the streets. None of the surroundings were familiar, I knew they weren’t in my hometown. Later, when they shared an update confirming that the winners had been notified, my heart sank as the realization settled in that I hadn’t won. It was over. I had lost, and didn’t know why. Over the next few days I found myself wishing that I could ask the judges what made their decision. What were they looking for? What could I have done differently to win? How many times in business have you lost a sale and wished you could ask what you could have done differently to earn the business? Have you ever invested time and energy into a customer, giving careful consideration to meeting each of their requirements, only to have them choose a competitor company, leaving you feeling confused and frustrated? That’s how I felt after the conclusion of the contest. After having another week to reflect on my personal journey, I realized how silly it was to feel frustration or gripe about not “winning” because in reality, the true prize was the transformation itself and making the commitment and sustainable change for a better life. Being a sore loser is not the best approach for seeking feedback. In business, it’s best to create a culture where feedback is always welcome, in good times and bad. If you’re only asking for feedback when you “lose,” you may get skewed results. It’s also important to come from a positive place, and be open to the feedback so that you can use it to truly improve. If you’re not asking anyone for feedback at all win or lose, you could be missing opportunities that you didn’t even know exist. You can’t win if you don’t find out how to better serve your customer’s needs. Unlike my experience which was a win no matter what, just because you might feel good about the work you are doing, you also need to be closing sales of one form or another. Finding ways to ask for and receive honest feedback is a great way to improve your offerings. It can be nerve-wracking because the responses you receive may cause you to face weaknesses within yourself or in your company, however it can reveal a lot and teach you how to better serve your ideal customers. Ask Directly: A strategy that has worked well for me as a consultant and small business owner is to ask my current and prospective clients directly for feedback. If you are a solopreneur or small business it’s likely that you are calling on clients directly. If they don’t choose to hire you, you can follow up with a polite email or phone call letting them know that you are seeking to grow your business and the best way to do that is to find ways to improve your offerings for your ideal target customers. In my case, I work directly with business owners and I think they have respect for what I’m trying to accomplish and more often than not, are willing to provide constructive criticism. Just the act of picking up the phone and calling and asking for the feedback can build a powerful connection with clients. Think of several local businesses that you frequent regularly. Now think of what impact it would have if you received a personal phone call or personal email or note in the mail directly from the owner, thanking you for your business and asking for your honest feedback. Would you take the time to respond? Customer Surveys on Site: You’ve probably seen comment cards at hotels and restaurants. Comment cards are simple ways to ask for quick feedback. Rather than a multiple choice rating scale or poor to excellent, instead consider asking your top 2-3 open ended questions that would allow the customer to reveal the most without taking up too much of their time. The downside of anonymous comment cards is that if a customer is unhappy or has a complaint you won’t be able to address it with them unless they provide their contact information. Ask for Reviews Online: Online reviews can be great for building your brand and reputation, even if some reviews are less than perfect, it’s an opportunity to show that you care and are responsive to your customer’s concerns based on how you respond to the review. Email Surveys: Email surveys can be very useful for tracking feedback regularly. You can subscribe to a service such as Survey Monkey and send a survey after a client interaction, purchase or event. Usually these services track the responses to a specific person’s email, which again removes the anonymity of the responder. It’s an easy and helpful way to regularly ask for feedback. Outside Marketing/Research Company: Of all the strategies, the best option to remove barriers and increase the odds of receiving unfiltered and unbiased feedback, is hiring an outside consultant or company to conduct the research on your behalf. Some customers may be reluctant to provide honest feedback without anonymity for fear of hurting someone’s feelings or getting someone “in trouble,” and an outside marketing company removes this barrier. Such research includes customer phone call interviews and focus groups, which when developed and implemented properly, can be extremely insightful. I like this guide from Duke Universityon how to conduct a focus group study. Most businesses will find this to be a bit overwhelming which is why it’s best to leave this type of research to professionals. Coaching: Another tool you might consider is hiring a business or personal coach to help you think critically about your goals, why you do what you do, who you serve and how to move toward your goals. A critical piece of that process is understanding what your customers need and finding ways to deliver on that. If there is something within your personality, process or how you’re running your business that could be hindering your ability to close sales, a good coach will help you discover and overcome that obstacle. While entering a contest might not be the appropriate opportunity to seek feedback, in our businesses we have plenty of opportunities. By choosing the appropriate time, developing the right questions and delivery channel, we can learn how to win our customers simply by asking them what they want and need. 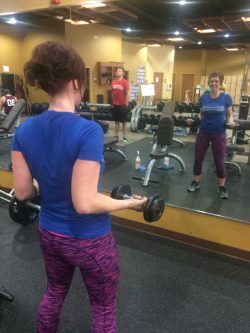 If you’d like to learn more about bodybuilding.com’s transformation contests, or support each other’s fitness journeys, connect with me here. Amber Swenor spends her time developing effective brand and marketing strategies so that you don’t have to. Download her 30 Greatest Lead Generation Tips, Tricks and Ideas eBook.